When Orville Ketchum (Peter Spellos) tells the girls about the Hockstatter murders, footage from The Slumber Party Massacre is reused. Orville (Peter Spellos) watches Hollywood Boulevard (1976) on TV, which Valerie (Robin Stille) watched in The Slumber Party Massacre. Three of the girls sit in the same position as the ones in The Slumber Party Massacre. The interior of the Hockstatter house was used in Slumber Party Massacre 3. That interior was a set on New Concorde's studio in Venice, which is now gone. The outside location for SORORITY HOUSE MASSACRE 2 was a house somewhere over in East Los Angeles. It's been over six years since I filmed at the location, and I can't remember the name of the street. It's just off the 10 freeway somewhere between La Brea and Crenshaw. I have no idea whether the house is still there or not. It was owned by the Baptist Church in a predominantly black neighborhood. The last time I used it was in 2001 - it became the interior house headquarters in PROJECT VIPER(the exterior was elsewhere). Both it and the spooky house next door were vacant, and very creepy at night. All the interiors, however, were shot on sets at Roger Corman's now defunct studio in Venice. The Old Hockstatter Place is located at 2200 South Harvard Blvd, Los Angeles, CA. You can look it up on Google Maps! The house right next door was used in Evil Toons, and the house right across from it was used in The People Under the Stairs. The house right across from the Hockstatter house is Orville Ketchum's house. The house looks the best (and the actual interiors are shown) in Fred Olen Ray's Inner Sanctum. It was also used for Teenage Exorcist and Spirits (which both show the inside), so it was basically a house that Fred and Jim Wynorski used a lot. 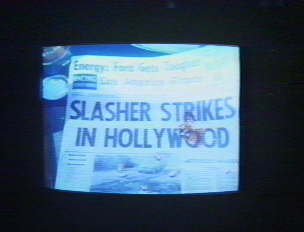 The trailer reuses footage from The Slumber Party Massacre and Sorority House Massacre. "I didn't want to pay to use this house, so I put up a window pane and curtain on the sidewalk and shot the Hockstatter house across the street. It wasn't Orville's hand either...it was mine. He wasn't on the set yet, so I slipped on his plaid shirt and pulled the curtain myself."